Our pupils understand that, similar to the Olympic athletes, they are able to achieve Gold in many different ways by simply doing their best, not giving up, learning from mistakes, being kind and looking after each other. We refer to these attitudes as being representative of a Gold Medal Learner. With the school community we have agreed a 2-year cycle of monthly values that link to our charitable work and fundraising, as well as termly events from Nursery to Year 6. We introduce and explore aspects of each monthly value in our Monday assembly and focus on these throughout the week, i.e. Circle time, P4C (Philosophy for Children). In our Friday achievement assembly we celebrate role models from each class who have demonstrated the value. These pupils receive a certificate and a special Gold Medal Learner’s baton that they keep at home for a week. The baton is returned and passed on to the next pupil in their class in the next Friday achievement celebration. We inform our parents through our weekly newsletter what our monthly value and weekly theme are and publish the names of these pupils. A photo of our weekly baton winners is also displayed in the school entrance. Our pupils learn to consider what the values mean for them and are encouraged to actively engage with them to understand their implications for making choices about our attitudes and responses. A values-based approach encourages reflective and aspirational attributes and attitudes. These can be nurtured to help them discover the very best of themselves, which enables them to be good citizens and prepare them for the life of work. Through our values we have created a positive school ethos and a better place for learning, in which pupils are able to attain higher academic results. Our school environment is a reflection of the range of values that our pupils represent; for example through our new Learners’ Values logo and the corridor photographs. It creates a purposeful teaching environment, in which staff are more fulfilled and significantly less stressed. It equips pupils with social capacities that help them work with, and relate to others effectively. It provides them with the self-esteem and confidence to explore and develop their full potential. It leaves no pupil behind, irrespective of their background. The over-arching theme is that we encourage our pupils to be resilient and reflective members of their school and wider community. At Prince of Wales Primary School we pride ourselves on delivering a whole-school curriculum that progresses pupils in their Spiritual, Moral, Social and Cultural (SMSC) development. Pupils are developed through a Values-based education. The whole school community have an understanding and respect for the British Values of the Rule of Law, Democracy, Tolerance for those of different faiths and beliefs, Individual Liberty and Mutual Respect. The table below highlights where British Values are taught and modelled across the school. 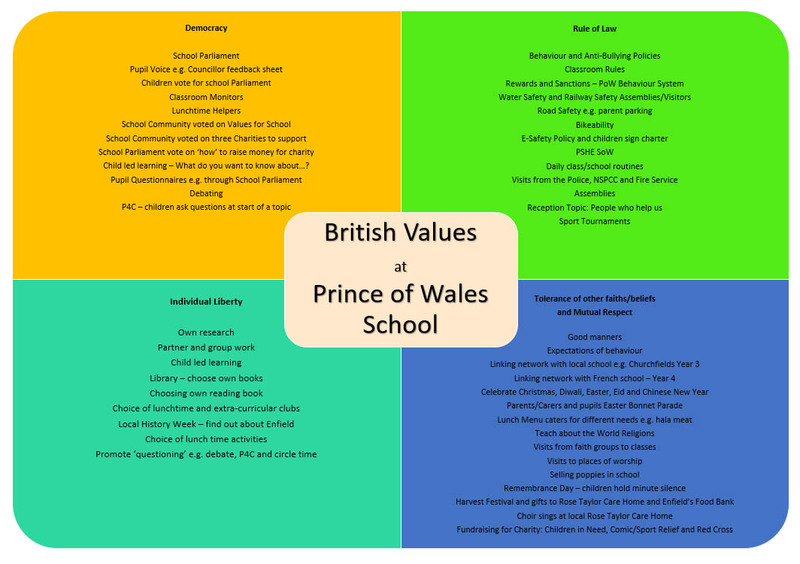 How are British Values evident at Prince of Wales Primary School? Leadership & Governors The leadership team lead a Weekly ‘Value for the Month’ Assembly and an ‘Award Assembly’ for children who model the Value: Baton & Certificate. 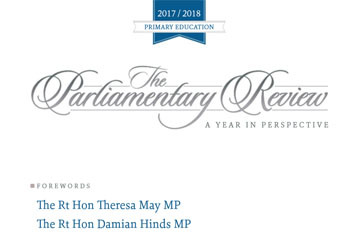 A weekly newsletter article is sent to the school community, to explore Values and offer ideas for Parent/Carers to put Values into practise at home/community. The leadership team monitor and respond to incidents of racism, bullying and radicalisation. Curriculum Values and PSHE Journals in all classes, including EYFS Reception, are kept by each class to record school events, charity days, school council feedback and a list of children who receive the weekly baton. Through Religious Education, the children learn about a range of religions, including Alevism. In addition, PSHE themes reflect the British Values: Relationships, Health & Well-being and Living in the Wider World. School Ethos & Attitudes The ‘Values Planner’ creates a two-year rolling programme: linking the ‘School Values’, five British Values, PSHE themes, 8 global dimension, school events and charity days. There is a Value for each month that is linked to at least one of the ‘British Values’. The school promotes LEARNERS Values, and has coined the phrases ‘A Gold Medal Learner’ and ‘A Gold Medal Role Model’. Environment The school has a LEARNERS logo of children. Values are displayed in the playground. There are photographs are pupils modelling Values in their learning, in all of the main corridors. There are ‘Thank you’ displays for KS1 & KS2, and a separate one in EYFS to say ‘Thank you to pupils who demonstrate British Values and School Values’. School Council & Pupil Voice The School Council meet each week and complete a form for class Values Journal. The PSHE and Values Journals are used for the children to write reflective thoughts about a PSHE theme i.e. Relationships, Well-being and Living in the Wider World. Pupil Voice is also a part of these journals. Classes also vote for a School Councillor, ask Councillors to feedback questions and concerns each week to leadership. During Values Assemblies, critical thinking skills are explored and the children are expected to take part and offer reflective thoughts. School Staff Staff voted for the 22 Values and which three Charities PoW could support. Staff are made aware of month’s Value and refer to it weekly in their Values Journal e.g. who received an award and why. Pupils Democracy is a key Value for the pupils to experience. The pupils voted on which three Charities PoW could support. The children also voted on ‘how’ to raise money for charity each term. Pupils share their reflections in Class Values and PSHE Journal. The pupils have a chance to demonstrate School Values and receive an award, baton (to take home for a week). They are expected to be ‘role’ models. Parents & Carers Parents/Carers also voted for the 22 Values, and which three Charities PoW could support. The Parents/Carers are made aware of month’s Value and are given weekly feedback in the newsletter e.g. how we are exploring the Value, and who received award in each class, and why. The Government set out its definition of British values in the 2011 Prevent Strategy, and these values have been reiterated in 2014. At Prince of Wales these values are reinforced regularly and in the following ways. Children have many opportunities for their voices to be heard. Each year the children decide upon their class rules and the rights associated with these. We have an active school council and every child is given the opportunity to represent their class on the school council. Children have to present to the class why they would be a good school council member and are then elected through a secret ballot. The Chair of the School Council attends the weekly School Leadership Meeting and puts forward questions and ideas that are discussed. The importance of Laws, whether they be those that govern the class, the school, or the country, are consistently reinforced at Prince of Wales. Pupils are taught from an early age the rules of our school. These are our Golden Rules. They are taught the value and reasons behind laws, that they govern and protect us, the responsibilities that this involves and the consequences when laws are broken. Visits from authorities such as the Police and Fire Service help reinforce this message. At Prince of Wales, pupils are actively encouraged to make choices, knowing that they are in a safe and supportive environment. As a school we educate and provide boundaries for young pupils to make choices safely, through provision of a safe environment and empowering education. 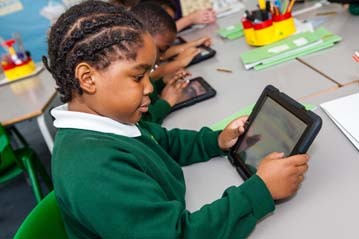 Pupils are encouraged to know, understand and exercise their rights and personal freedoms and advised how to exercise these safely, for example through our E-Safety and PSHE lessons. Whether it be through choice of learning challenge, of how they record, of participation in our numerous extra-curricular clubs and opportunities, pupils are given the freedom to make choices and to understand and accept their consequences. Our school ethos and behaviour policy has revolved around core values such as ‘Respect’, and pupils have been part of discussions and assemblies related to what this means and how it is shown. Enquiries based lessons, critical thinking and debates help to develop children’s understanding of others around them. The school ethos and aims promote respect for others and this is reiterated through our classroom and Golden Rules, as well as our behaviour policy. Children learn that their behaviours have an effect on their own rights and those of others. All members of the school community treat each other with respect. Prince of Wales is a diverse and multicultural school. We celebrate Black History Month and recognise the achievements of people from different cultures and religions. We actively promote diversity through celebrations of different faiths and cultures. Religious Education and PSHE curriculum reinforce messages of tolerance and respect for others. Members of different faiths and religions are encouraged to share their knowledge to enhance learning within classes and the school. The children visit places of worship that are important to different faiths. We also have themed assemblies and weeks where we celebrate and learn about different cultures and beliefs. At our school we will actively challenge pupils, staff or parents expressing opinions contrary to fundamental British Values, including ‘extremist’ and life-limiting views. YOUNGSTERS from a primary school in Enfield Lock were chosen to represent children across the borough to mark Commonwealth Day. The pupils from Prince of Wales school, in Salisbury Road, joined Enfield mayor Ali Bakir, Enfield Council leader Doug Taylor and the cabinet member for children Ayfer Orhan to hoist the Commonwealth Flag above the Civic Centre, in Silver Street, Enfield. The 22 children raised one of 730 flags flown throughout the day on Monday. For the first time in maritime history, the Commonwealth Flag was also raised on board all ships belonging to the fleets of the world’s leading cruise lines, P&O and Cunard.